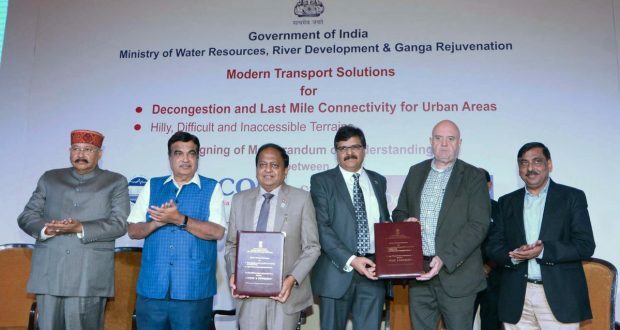 Newdelhi:5/11/18:Union Minister for Road Transport & Highways, Shipping, Water Resources, River Development and Ganga Rejuvenation Shri Nitin Gadkari has said that the country needs futuristic technology for developing its transport sector. He stressed upon the need to cut down congestion and resultant pollution in cities. Reiterating his commitment for promoting transport innovations that are pollution free and cost effective, he said that ropeways, cable cars, funicular railways can be very useful means of transport for hilly and difficult terrains and as last mile connectivity options in congested cities. He said these transport options would also be very useful for tier two cities and hoped these would motivate people to shift from personal to public transport.